WE ALL HAVE THESE HORSES ON OUR BOOKS. 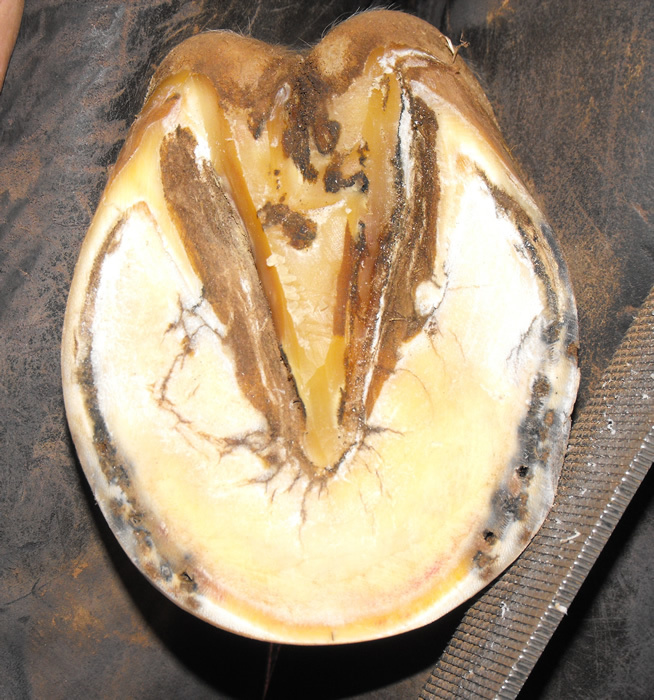 THEY ARE HEADING DOWN THE BACK SIDE OF THE HILL IN THEIR WORKING LIFE AND THEY NEED A LITTLE HELP FROM THE FARRIER. NOW I’M NOT TALKING ABOUT CRIPPLED OR LAME HORSES PER SAY, JUST HORSES WITH MINOR PROBLEMS THAT ARE ACQUIRED FROM A LONG ACTIVE LIFE. This particular horse we will call Sugar Lump is just such a horse. Sugar Lump is a Hunter and lives the typical hunter life of bath in the morning, training, bath again, 3 to 4 days a week and shows on the weekends with more baths. I don’t really understand all the bathing but it’s hard on the feet. Aside from the feet being wet all the time things tend to get a little loose and run forward with age. 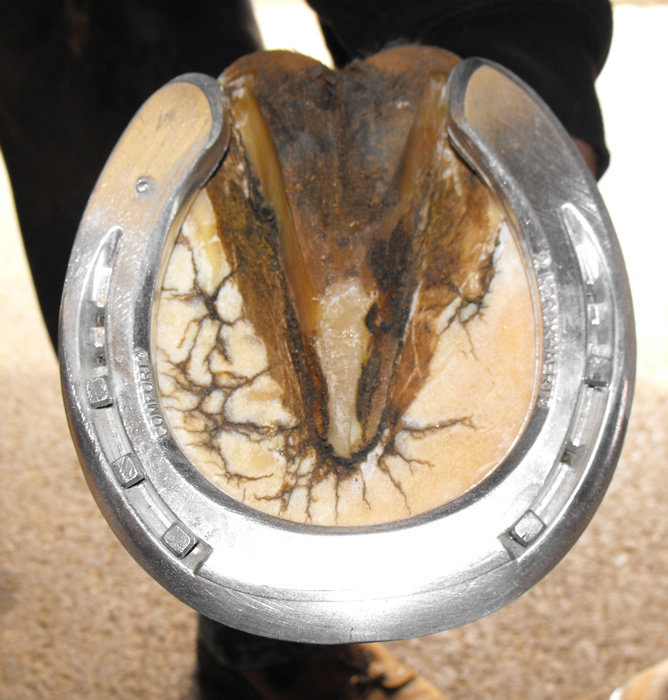 The first thing I look for when shoeing every horse is a lesson I learned from Mr. Edward Martin at the second clinic I ever attended when he came to this country. 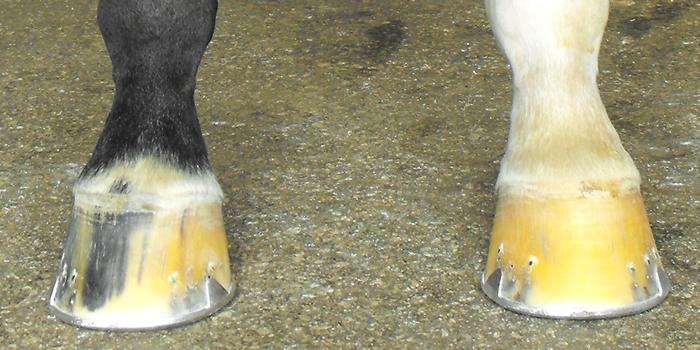 In his opinion the “only two hard and fast rules that apply to a horse’s feet are Straight Hoof Wall (no flares) and Symmetry,” with almost everything else there is some grey area. Looking at the picture with the shoe pulled before the feet are trimmed, the heels are a bit under run and the toe is worn away. 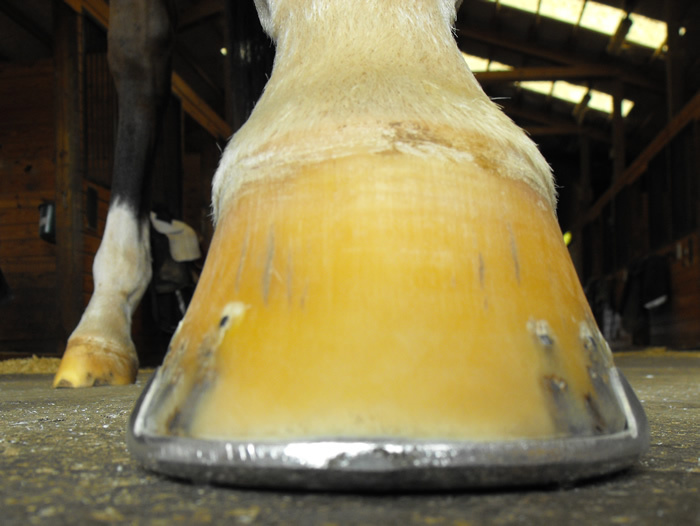 From the bottom you can see the heels forward and the toe missing, but you can also see the distortion in the quarters. It is my opinion that the toe was not being supported enough, creating the asymmetrical foot and distortion of the wall in the quarters. I believe this was caused by setting the shoe back and not supporting the toe. I’m not saying I don’t care about break over. I just don’t like to unload the toe to achieve it. 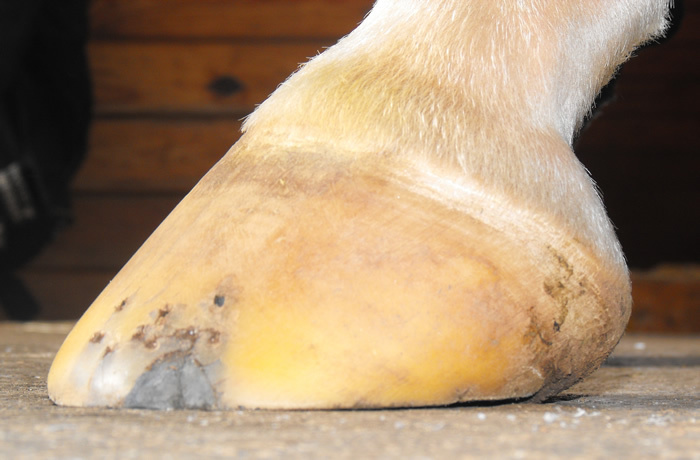 Left front- note thin wall at toe and lack of symmetry. My goal with the trim is to bring the heels back as close to the highest and widest part of the frog as I can and to be as kind as possible to the toe or lack thereof. I will make the wall approximately the same thickness (excluding the missing toe) from heel to heel. You should only take off what you must to reestablish straight horn and symmetry. 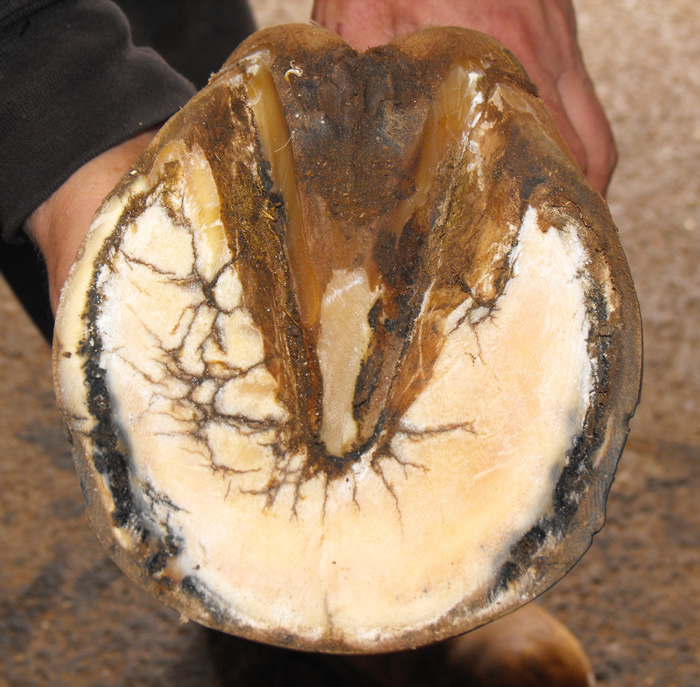 Healthy sole, frog, and hoof wall do more to support the horse than anything you can do with a shoe. 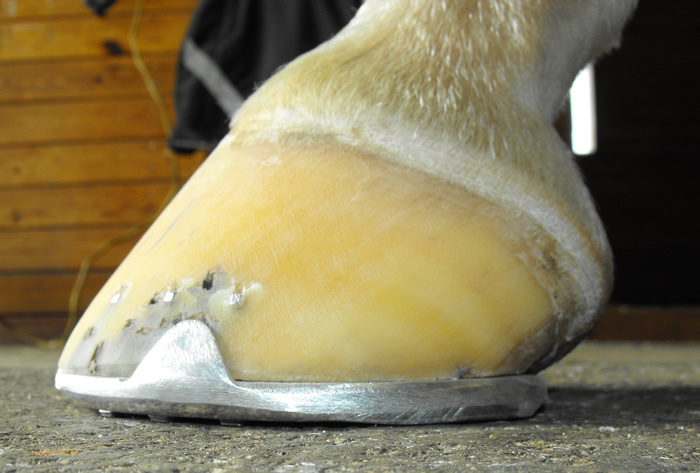 Since we are shoeing a Hunter we have to use aluminum on the front- it must be a law. I will be using the new Kerckhaert Aluminum Comfort shoe. The Comfort has enough mass to support a large horse. The nail holes are well positioned in all sizes, enabling good solid nailing. The toe has a good radius with no corners and the roll goes from quarter to quarter. design with good toe and heel support plus rolled toe and toe quarters. I want to fit the front half of the foot as if the toe wall were there, no more no less. 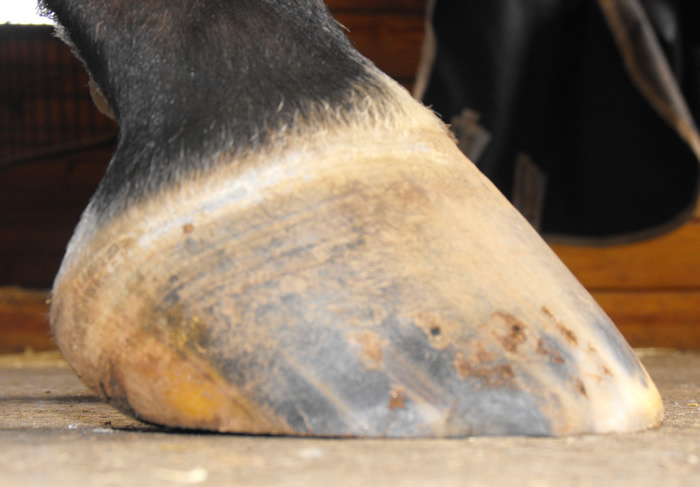 I want to fit the back half of the foot with enough expansion and length so at the end of the shoeing cycle the foot will be on top of the shoe and not over it. 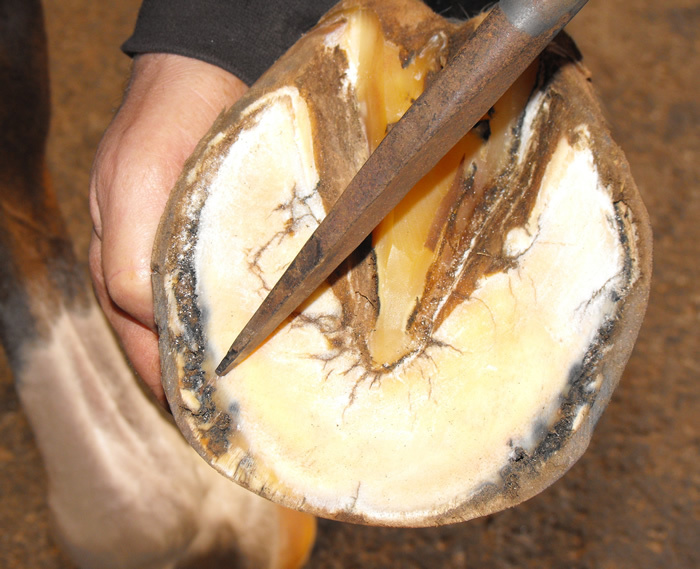 By taking the time to make the hoof wall the same thickness and straight in the trim, all the nails will start in the white line. This will not only make for easer nailing, it will keep the wall from splitting as badly under wet conditions. With the rolled leading edge of the shoe from quarter to quarter not only can you ease break over but there are no corners so the advantage is equal diagonally as well as straight. Looking at the shoe on the foot you can see that the roll of the leading edge allows the foot to break faster while still supporting the toe. Finished job, note breakover aspect even with shoe fit to toe. 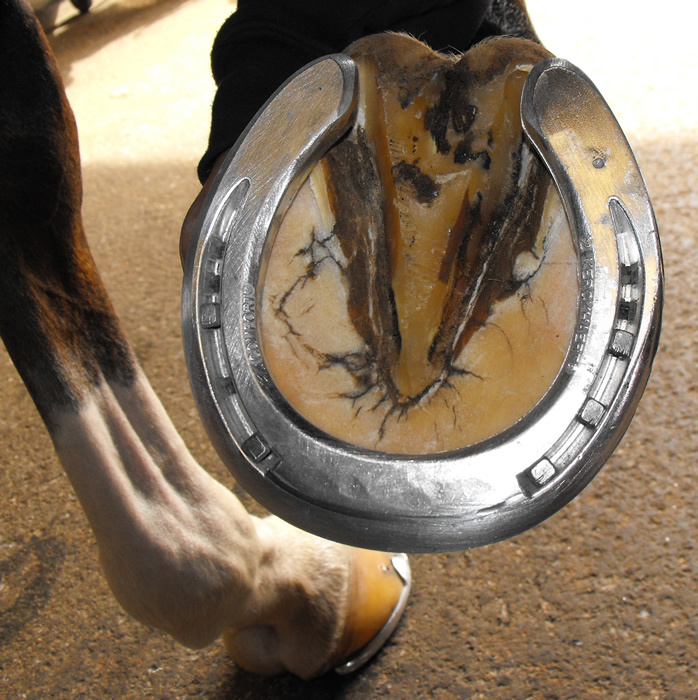 Bottom of finished job illustrates good heel support and breakover point. 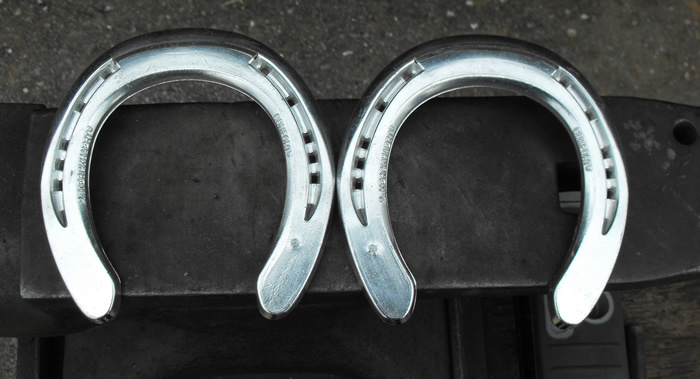 One of the best ways to tell if you are on the right path with any horse you shoe is to pick your work apart 5 or 6 weeks later when you come back. It’s easy making one look good on day one, but if it still maintains your overall plan only a little longer at the end of the cycle you can’t be far off.